4.5g measuring scoop enclosed. Follow the feeding guide carefully. Use only the scoop enclosed. Never add more or less than the stated amount. Always prepare the feed immediately prior to feeding baby. Karihome Goat Milk Products are a fantastic quality approach to dairy for those allergic to or having troubles with cow’s milk. Goat’s milk is not only easier on the digestive system in children but in adults as well so you can enjoy the benefits with your children. 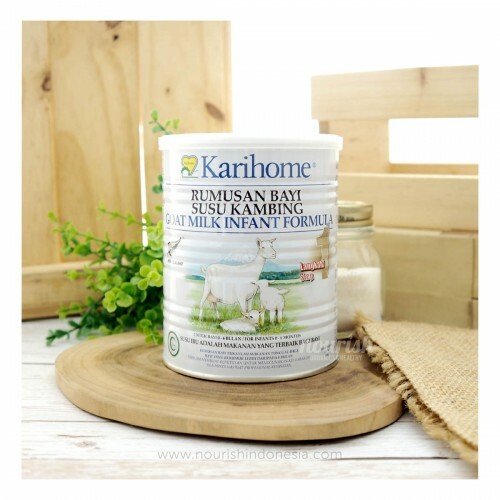 Karihome provides milk formulas for children from 6 months old to 3 years old and adults. There is a specific formula for each different age group to ensure that your children’s nutritional needs are met. Often there is confusion about lactose intolerance and it can be incorrectly diagnosed. Sometimes, people who believe they are lactose intolerant find goat milk an agreeable product. All milk from mammalian species (cows, goats, sheep, humans) contains lactose, which is the major carbohydrate in the milk of most species. However, sometimes cow milk protein intolerance (CMPI) is misdiagnosed as lactose intolerance. In cases of CMPI, goat milk can be an effective alternative, especially for infants and children.